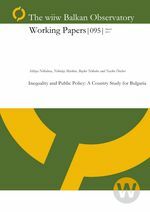 This paper is an attempt for measuring the impact of public policy on the inequality in Bulgaria. An analysis based on the Bulgarian Household Budget Surveys shows that the tax burden in Bulgaria, nevertheless increasing in the upper quintiles, declined between the beginning of the transition period and the year before the EU accession. Using different inequality measures we have found that despite the limited possibilities of the data, taxation policies also contribute to some extend to inequality reduction in Bulgaria. As regards the social transfers, unemployment benefits and child allowances are found to be the main social payments reducing the inequality among Bulgarian households. Using quantile regression is found that the coefficients of the effective tax rates increase across the quintiles for the entire period. The coefficients associated with the share of VAT expenditures in the total income decrease as one moves from the lowest to the highest quintile of the consumption distribution.